Remember those times? The times when the pen you wrote with in class had an impact on your image and sometimes even determined which group you belonged to? Geha versus Pelikan! Times long past I realized not too long ago. The company Geha doesn’t exist anymore! I recently found out by accident, when I tried to order a Geha Füller (fountain pen) for my eight year old, only to find out that the company Geha had been sold to its rival Pelikan already in 1990…. Really!! 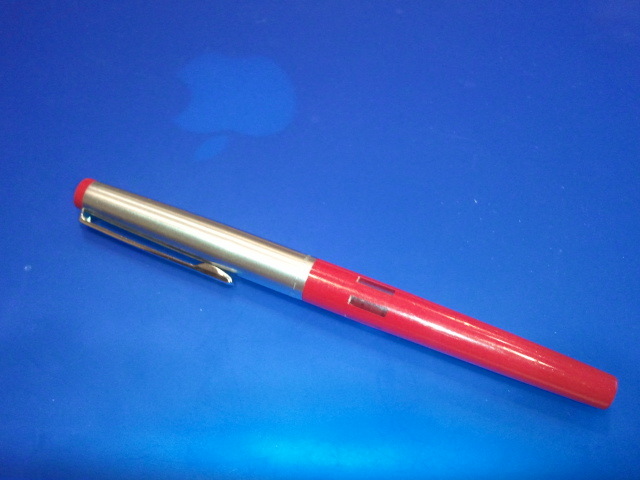 I loved my red Geha fountain pen, and still remember how very proud I was when I finally had advanced from my blue beginner Pelikan to the cool Geha with the slender ink cartridge windows. In fact my eight year old son thinks it’s cool too after having seen mine. That’s how this whole search for a Geha Füller started out in the first place. Back in my school days there was a distinction between Geha and Pelikan owners and some would never even in the slightest have considered switching between these brands, so convinced were they of their particular ‘Füller’. Brand loyalty was definitely much stronger then. My first fountain pen was a blue Pelikan. In fact many children started first grade with a Pelikan, since it was said to be very sturdy and therefore the best fountain pen for an inexperienced first grader who is learning the proper use of such a writing tool. The Geha Füller on the other hand had a certain flair. It stood for design and sophistication and was simply just cool. It certainly was the writing tool for the older and more experienced student. So when my eyes had set on that beautiful Geha of my friend with its sleek design and those cool little windows for checking the ink cartridge level, I just had to have one. It was like trading in a Volkswagen for a Porsche. I have forgotten the promises I had to make to convince my parents to buy me one, but one day my wish had come true, and I was holding a beautiful version in my hands. I treasured it, and it became my constant companion throughout my scholastic life and beyond. Put away carefully in a drawer, my eight year old son recently dug out my school-day treasure and with it so many long-lost memories. The Geha fountain pen was not only special in its design but also in its functionality. No other pen before and after, at least to my knowledge, sports this little ‘lever’, underneath the steel nib that one could press in for an emergency reservoir of ink. It also had this metal brace inside the cartridge compartment holding two cartridges together which gave the Geha an elegant touch in my eyes. I wonder if children these days know how to cherish a pen like we used to. Like so many things these days in our ‘Wegwerfgesellschaft’ (throwaway society) also pens seem to have entered the fashion world, are part of a fashion statement and get changed accordingly. For others a pen is just a useful tool that serves the purpose to jot down notes, and as long it does precisely that, looks don’t matter. As soon it stops working, it wanders into the trash. Children in the US also don’t start out learning to write with a fountain pen, but are allowed to use a ball pen straight away. Writing might be much easier that way but also less fun. Only imagine, they never get the joy of using a ‘Tintentod’ (ink killer)! 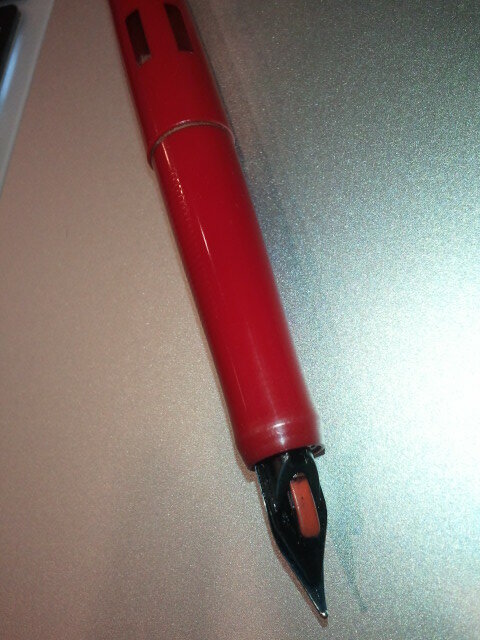 The ink killer, that cleans up unsightly ink smears of a sheet of paper and makes it look magically new again. I believe in Germany it is still a common tradition to give an ‘Erstklässler’ (a first grader) a Pelikan fountain pen in his/her ‘Schultüte’ (school cone), but I am not sure if ‘Schönschrift’ (penmanship) is still done with a fountain pen or if the younger generation has switched to use ball pens as well. It will be the death of the ‘Tintentod’! What a shame! The computer age of course is certainly no help in these developments either. In the near future I am sure fountain pens will be considered a rarity, but then, because of it, might gain attention again, and be treasured like an old classic automobile. So I ordered him his first green Pelikan! My first fountain pen was a Geha, which my parents bought for me in the 1970s during a visit to Germany to visit relatives. I fell in love with the fountain pen when I saw my cousins using them to do their homework. And I loved that tintenlöscher (ink eradicator) pen! 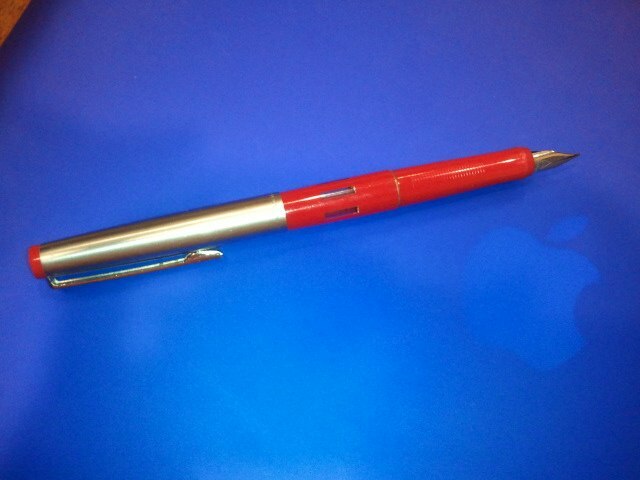 I used that Geha for a year or so in school, but soon ran out of ink, and switched back to ballpoints, at which point the Geha was misplaced until recently. In high school, I used a couple of Sheaffer fountain pens for a while, but they were never as nice as the Geha. In University (early 1980s), I bought a Sheaffer NoNonsense, which I’ve been using ever since, along with a Pelikan that I bought in Switzerland in 1988. In the last couple of years, I’ve become more interested in fountain pens, and have collected a number of fountain pens, all of which I use (in rotation). Most are Pelikans (the adult models like the M200, M600, etc. ), but I have a few Parkers and Sheaffers as well. IMO, it wasn’t until the invention of the liquid- or gel-ink rollerball that the ballpoint has gotten anywhere close to being as easy to write with as a fountain pen. Writing with a ballpoint still gives me the shivers more often than not.